I love accessories with a pedigree--scarves, bags, belts, or costume jewellery made by a company that did its business in exemplary fashion for decades, sticking to the principles of its founders. Given the demands of modern marketing and celeb-based brand development, these boutique businesses, often family-run, are currently at a huge disadvantage, and have two obvious options to survive. The first is to allow the name and design archives to be acquired by a money-rich conglomerate, which with luck will be enlightened enough to hold true to the brand's ethos. The second is to depend on the steady custom of the wealthy few who are not interested in broadcasting their advantages through easily recognized logos. As these few become fewer indeed, more and more of these businesses are simply shutting their doors. But because their products were created to last, the brand lives on, fashion's fleet of Flying Dutchmen, in the secondhand realm, where they are known to and sought-after by connoisseurs but otherwise so under the radar that the prices are invariably well below the pieces' actual worth. Such is the case with the leather goods of the now defunct Mark Cross. The name may mean little to most luxury goods buyers nowadays, but back in mid-century, it stood for beautiful luggage, handbags, and other leather goods. Grace Kelly carried a negligee in a Mark Cross bag in the film Rear Window. Richard Burton and Elizabeth Taylor ordered suitcases by the containerload. The company sold the first wristwatch ever in the United States. According to its chairman in 1969, customer service was paramount. "If someone calls up from a hotel to say his suitcase won't lock, we treat it as an emergency," he told Time magazine, "He gets immediate help, no matter how small a customer he is." I was lucky enough to experience this service firsthand, as a young editor in the mid-1980s, when the Fifth Avenue branch of the store was still in operation. 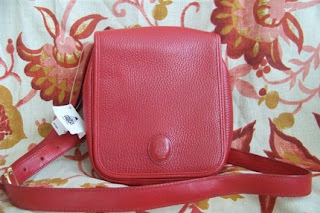 My mom had given me her old navy blue, boxy little Mark Cross camera bag (so called, I guess, because it was just large enough to hold an Instamatic, a wallet, and a lipstick). It was a cross-shoulder strap style, which was just as well in Manhattan in those years, and I wore the thing near to death. Inevitably, some of the stitches detached where the strap met bag. I braved it into the store, abashed to be carrying a twenty-year-old item, hoping someone could tell me the name of a good repair shop. The saleswoman practically snatched it out of my hands, telling me to come back in a week. "But, how much?" I asked, being on an extremely stringent budget. "Oh," she reassured me. "Of course there's no charge." So when, a few weeks ago, in Selfridges, I saw a chic young woman carrying an over-the-shoulder boxy little bag and looking great with it, I reckoned the time had come for another Mark Cross. Here it is, off Etsy for $39/£24. If you love beautiful things, but are not so keen to pay for their celeb-driven marketing, you might want to keep this stealth brand in mind.